Today I want to introduce you to some really creative folks. If you are familiar with Etsy, you may know my friend LindaEve. She does outstanding work repurposing fabrics into lovely bags among other things...a true Eco-Etsy gal. 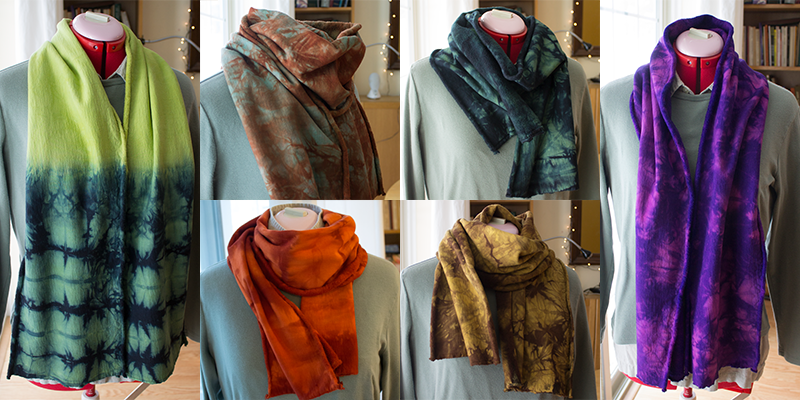 Linda and her husband Mark Everett are dyeing to tell you all about their newest project - over-dyed scarves made from bamboo/organic cotton fleece, bamboo/organic cotton jersey, and repurposed pure linen. These delicious, colorful scarves are currently for sale at Ebb in Hopewell NJ and at Through the Moongate in Highland Park NJ, as well as online at Linda's Etsy shop. These scarves of bamboo are soft and welcoming....many color choices available to go with any outfit. 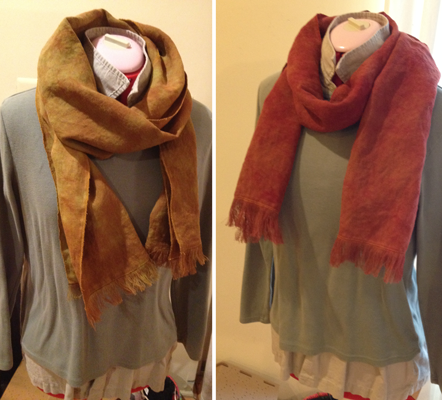 Can't you just imagine the feel of these wonderful linen scarves? What a great fashion accessory! Scarves are so 'in'. They can be tied in a variety of ways and with the different fabrics available, you are sure to find something that fits your style and budget! Contact Linda and Mark through Linda's Etsy shop or visit the shops above if you are in the NJ area. If you have any questions, they will be happy to answer them and also to discuss your needs! These make the perfect gift for your graduate, Mother's Day, birthdays or just for yourself. Be sure to let them know that Sue sent you! I am finding that some of my projects around the house have been keeping me away from updating my blog regularly. I do love to paint and am a neat painter but am not looking forward to doing the ceiling in the bathroom as I always seem to make more of a mess than I do with the walls. This small bathroom is going to be transformed from a taupe room with ivory and burgundy toile curtains to a darkish gray and I am going to order some of my own designed fabric from Spoonflower to make the shower curtains. The main theme of this room will be dark gray and white along with some black accents. 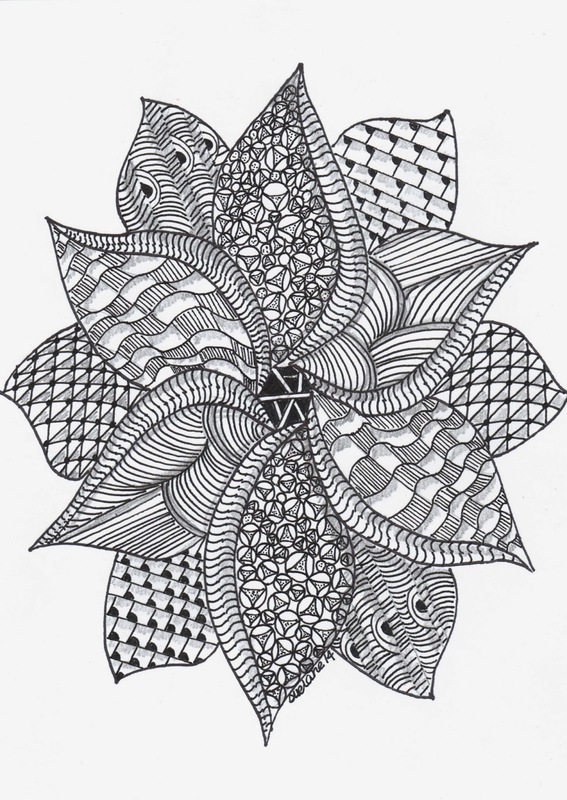 My fabric is based on one of my Zentangle designs. A sample of the fabric arrived, it is so much fun seeing your own design imprinted on fabric! Slowly I will get this room done! That's it for now. Off to paint my mailbox....since it is still so cold outside I took it off the house and brought it inside. I am sanding it and giving it a fresh coat of ivory paint and then will letter/number it with my address in black paint. With my address on it, I will always know where I am! Thanks for looking! I can be reached at penandinkwell@yahoo.com. I also love Pinterest and have creations posted on my boards.